Learn how to “travel as much as you want” – and make it FREE! 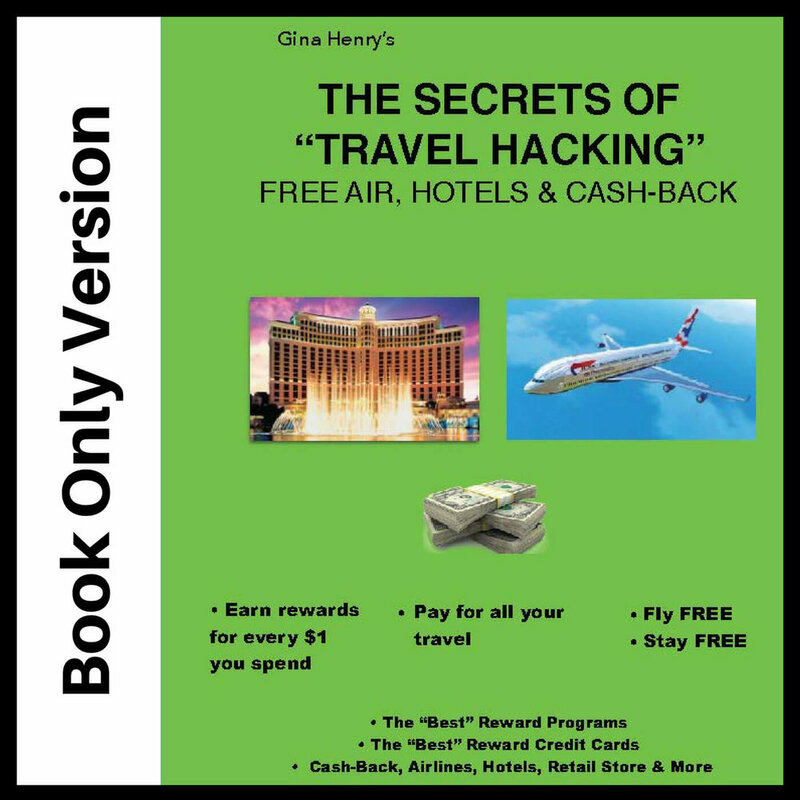 Author, Gina Henry will show you how to make your vacations free and keep your money in the bank. She has traveled to 93 countries and all 50 states for FREE in the past 25 years using the ideas in this class. Gina teaches in 90 cities nationwide. If you’re near retirement, retired, re-tooling or changing careers, a student, or anyone who likes the idea of making additional income to support their travel dream and keep their retirement money in the bank, this book is for you. Learn over 200 ways to free travel, volunteering, fun work-vacations & paid travel opportunities to have the time & money to travel as much as you want. Earn FREE airline tickets, hotel nights, cruises, tours, car rentals, vacation meals, & more in the USA & worldwide! Book + Audio version. See above for description. If you are near retirement, retired, re-tooling or changing careers, a student, or anyone who likes the idea of making additional income to support their travel dream and keep their money in the bank, this book is for you. Arthur, Gina Henry will show you how she has afforded her money-making travel lifestyle to over 93 countries and all 50 states. Do you want to stop working a 9-5 job & travel more? Or maybe you are one of the 75-million baby boomers retiring & pursuing their travel dream? Learn over 200 ways to travel free. Earn FREE airline tickets, hotel nights, cruises, tours, car rentals, vacation meals, & more in the USA & worldwide! Maximize your reward points. Learn about money-making travel careers, mystery shopping, teaching English, leading tours, writing articles, photography, volunteering, driving, seasonal jobs, fun work vacations, & other paid travel opportunities. Do you like to shop? Would you like to make extra income by shopping at retail stores, restaurants and other businesses in your city? Businesses need to know more about their customers, especially during these challenging economic times. Get paid to shop or keep the items you buy on your assignment or receive something FREE like dinner for two at a nice restaurant. Plus, mystery shop on vacation! Teaching English has become a high paying career or , simply a great way to pay for your vacations. English is the world’s business & travel language. If you speak English, you can teach conversational English and pay for your worldwide travels! Turn your vacation into a moneymaking opportunity. If you love to travel, you can travel free by working for a tour company or putting together your own tours for friends, family or groups. Talented tour guides & trip planners are in high demand. Travel & Tourism is the world’s fastest growing industry and is recession proof even during these challenging economic times Work for a tour company or start your own business. Learn how to earn hundreds of thousands of airline frequent flyer miles & hotel reward points without ever stepping foot on a plane or paying for a hotel. Become your own “Travel hacking” expert and learn how to earn reward points quickly & simply. Redeem them for high-value trips. Flights and hotels are typically the most expensive part of your vacation budget. Save thousands of dollars and travel the world to more places than you could have dreamed - for FREE! Gina will show you her easy “Beginner Strategy" then graduate you to more advanced strategies that earn you 1 million+ reward points a year. All the major reward programs will be detailed: Delta, American, United, Southwest, American Express, Discover, Chase Ultimate Rewards, Citibank, Capital One, Marriott, IHG, Hyatt, Hilton, and more. Learn strategies for maximizing points in each reward program via the airline alliances One World, Star Alliance, Sky Team, etc. Don’t miss out on the perks of Southwest companion tickets and Alaska Air reward programs. Also learn tips for flying business & first class. You many never have to fly coach class again. Live & work wherever you want. Become a digital nomad and be location independent. Join thousands of individuals living this lifestyle - many are new in their career, independent contractors, employees working remotely, families homeschooling their kids on the road, and retirees using their skill & talent to support their retirement and travel. You no longer have to choose between work and travel. You can have both. Make your travels sustainable by earning a living as your travel. Pay zero rent or mortgage. You might never need to clean house again!